This is Rachel. I met Rachel on the morning of our college orientation back in 2006…wow! We have been together through thick and thin over the last eleven years. From heartbreak and school stress, to new jobs and new homes, we were there. Not everyone has a Rachel, and I am lucky to be one of the lucky few. My mom has always told me that you don’t need to have one hundred pennies worth of friends, that you truly need four good quarter. Rachel is definitely that for me. As you might guess, Rachel is getting married. She and her fiance are amazing together. You know when you see a couple and they just work, that’s Rachel and Jason. They did the long distance thing for a while, the NYC thing for a while, and now they’re going to do the married thing for life. What is even better about their relationship is that Rachel and Jason had been connected since they were little. They grew up in the same town, they had indirectly spent many occasions together, and now, their lives easily blend from Millman and Rosenblatt to The Millblatts. I loved being part of all the pre-wedding activities. 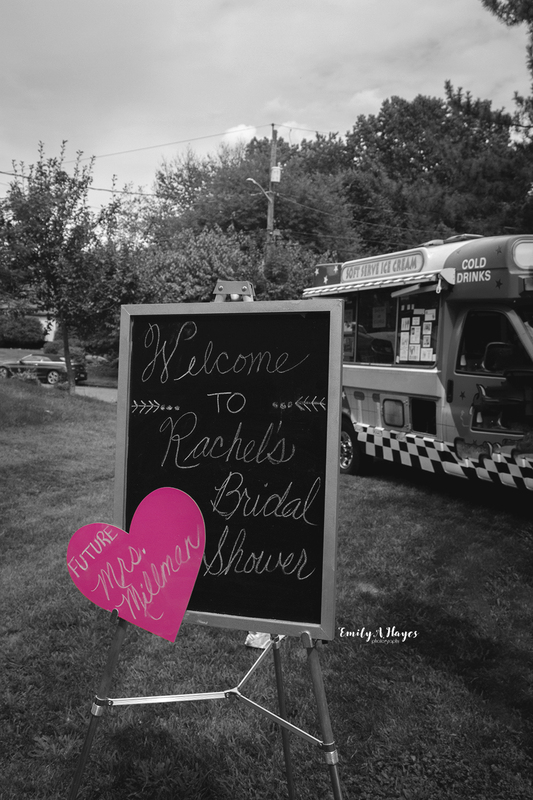 Rachel’s sister-in-law-to-be helped coordinate a beautiful wedding shower for Rachel. Every detail was thought from. From the flowers to the bellini bar, every i was dotted and t was crossed. But the grand finale might have been the sweetest gesture ever. She arranged for Jason to drive up in an ice cream truck. Rachel’s face when she saw Jason was perfect. Happiness, joy, excitement, and true love were just a few emotions that were beaming from her face. Their wedding was also a big time for my relationship with #theadventuresofsj. When I went to Rachel’s bachelorette weekend, it was the first time I had left her at home for the night. When we (my husband and I) go to their wedding, this will be the first time that we leave #theadventuresofsj for the weekend. A friend reminded me that even though we are celebrating Rachel and Jason, we also need to celebrate the accomplishment of our marriage. Celebrate the fact that we have made it five years, three moves, four jobs, and one kid. Marriage is hard and needs to be tended to and celebrated. Here’s to love, happiness, and future friends for #theadventuresofsj. Mazal tov Rachel and Jason!